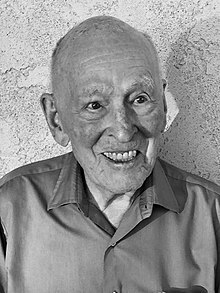 Paul Delos Boyer (July 31, 1918 – June 2, 2018) was an American biochemist, analytical chemist, and a professor of chemistry at University of California, Los Angeles (UCLA). Boyer shared the 1997 Nobel Prize in Chemistry for research on the "enzymatic mechanism underlying the biosynthesis of adenosine triphosphate (ATP)" (ATP synthase) with John E. Walker, making Boyer the only Utah-born Nobel laureate; the remainder of the Prize in that year was awarded to Danish chemist Jens Christian Skou for his discovery of the Na+/K+-ATPase. Boyer died two months shy of his 100th birthday in Los Angeles, California on June 2, 2018 of respiratory failure. ↑ "Notable Signers". Humanism and Its Aspirations. American Humanist Association. Retrieved September 15, 2012.